Urus, Ishinca and Tocllaraju. For Urus and Ishinca it is not necessary to have previous climbing experience. Obviously, we offer all the support you need to reach the summit of these peaks. 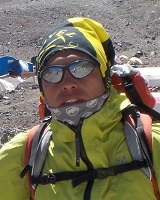 After Urus and Ishinca you should be customized to the climbing techniques in order to be able to reach the summit of the more challenging Tocllaraja, which might be your first 6000er. For all three ascents good acclimatization is required. Tents and alimentation is carried up to the base camp by porters. Our clients carry only their own climbing equipment and personal clothes.